"Diameter Java Base Protocol API"
Description of "Figure A-1 Oracle Diameter Architecture"
The Base Protocol library is the main element in the picture. It contains the base protocol implementation, and is available as a standalone C++ shared library. On its upper side, the Diameter Base Protocol library, provides an application registration mechanism. 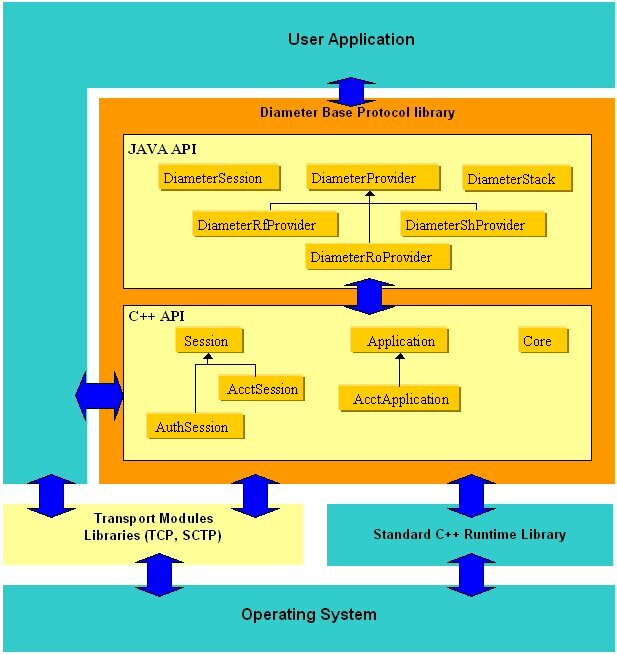 The specific application subclass AcctApplication can be derived by user depending on the state machine required to be used by the application to be implemented. Each Application object can implement its own session subclass. Specific session subclass (AuthSession and AcctSession) can be derived by user depending on the state machine (Authentication, Authorization or Accounting) implemented by the application.On its lower side, the Diameter Base Protocol library also provides an API to interact with its transport modules. This API enables the user application to instantiate any subclass of the Transport class. These subclasses can be system dependant, and can provide any kind of transport protocols for Diameter. Diameter comes with a socket based transport module for TCP and SCTP kernel implementations in Unix-like environments.The Diameter Base Protocol library also provides a direct Core interface. This API supports all the configuration needs, including dynamic realm-based routing table configuration, generic tracing and logging callbacks, external memory manager support, and dynamic dictionary extensibility. The Diameter Java API is an API compliant with JAIN. The JAIN initiative represents a community of communications experts defining the necessary Java interfaces as an extension of the core Java platform to migrate proprietary communications networks to open standardized based networks. The Diameter Java API is a wrapping of Diameter C++ API. This section defines the Java API for the Diameter Base Protocol. The Java interfaces and classes described in this part enable Java developers to build application based on the Diameter base protocol.This Java API was designed in such a way that it is possible to provide several implementations of it. The next section will define and describe in details one of possible implementation: Rf Diameter Application. Description of "Figure A-2 Oracle Diameter Java API Architecture"
Through Diameter interfaces, a Diameter protocol stack provider is obtained from the factory, and Diameter listeners are then attached to the providers created by the Diameter stack. The DiameterFactory interface is used by the Diameter applications to obtain specific instances of different implementations of all interfaces defined in Diameter Java API. The only instance of the DiameterFactory can be obtained using the getInstance() method. The DiameterStack interface represents a Diameter Protocol Stack as defined in [RFC 3588]. This interface is used also to create providers, routes and listening points. A Diameter stack must be initialized and configured before any messages exchange (see section [6.2]). The DiameterProvider interface represents a Diameter Application (with one Authorization/Authentication Application ID or one Accounting Application ID) running on top of the Diameter base protocol.The DiameterListener interface processes events that are triggered by an object implementing the DiameterProvider interface. There can be only one listener per provider. This interface must be implemented by the application programmer. The DiameterRoute interface represents a route entry in the realm-based routing table. A Diameter client application calls the createDiameterRoute method to declare remote peers. The DiameterListeningPoint interface represents a local transport address for a Diameter stack and enables it to accept incoming connection from declared remote peers. The DiameterMessage interface represents a Diameter Message as defined in [RFC 3588]. The Diameter messages are composed from AVPs added by calling add() method. The DiameterSession interface represents a Diameter session as per [RFC 3588]. A Diameter application calls the createClientDiameterSession method from the DiameterProvider interface if it needs to send a request for a new Diameter session. Then it can send the request by calling sendMessage method. Also, an incoming request can be handled by calling createServerDiameterSession to create a new server session, then using sendMessage to send the response. DiameterSessionEvent: represents all the events which are related to a Diameter session such as received messages, session timeouts, and session errors. The Diameter stack delivers information to the user application by creating instances of the Diameter Event class and passing these instances to the DiameterListener.processEvent method. This section defines a Java API for the 3GPP [TS 32.299] Rf Interface over the Diameter protocol ([TS 32.225], [TS 32.200] and [TS 32.240] in order to specify). This section describes the Java interface. The Properties parameter specifies the features that will be handled by this Rf provider. This is a list of properties which may contain a number of options. See section [3.2.6] for know more about Rf Application options. The DiameterRfListener interface processes accounting messages that are received by the DiameterRfProviderImpl class implementing the DiameterRfProvider interface. A DiameterRfListener instance is registered to a provider by the following method DiameterRfProvider. setDiameterRfListener (). This interface provides two principles methods: accountingRequestReceived() and accountingAnswerReceived(). The first one must be implemented and called when the option AUTO_ANSWER is set to false. In this case, the server must be able to create an accounting answer corresponding to the received accounting request. The second one processes the received accounting answer. The 3GPP Rf Interface dictionary is returned by getRfDictionary() and must be extended by the Diameter stack. Like any Diameter application, an Rf application can receive/send accounting events from/to the Diameter stack. TX_TIMEOUT_EXPIRED: The event is triggered by the stack on session supervision timer expiration. INTERIM_TIMEOUT_EXPIRED: The event is triggered when the time specified by the interim interval duration has expired. TERMINATE_SERVICE: The event is triggered by the stack when service is terminated by the stack or by server. DiameterInvalidMessageReceivedEvent(Object, DiameterSession, Message): This event is triggered by the stack when an invalid message has been received. This event object contains the invalid received message. EVT_OUT_OF_SPACE: The event can be triggered by the application to inform the stack that there is no more space to store the received/sent accounting message. This event is created by instantiating DiameterRfOutOfSpaceEvent class with the type parameter set to EVT_OUT_OF_SPACE. When the Rf server AUTO_ANSWER mode is activated and once the EVT_OUT_OF_SPACE event has been triggered, the stack automatically responds with an answer message including the Result-Code AVP set to DIAMETER_OUT_OF_SPACE and this until the EVT_NOT_OF_OUT_SPACE event triggering. EVT_END_OUT_OF_SPACE: The event can be triggered by the application to inform the stack that there is space again to store the received/sent accounting request message. This event is created by instantiating DiameterRfOutOfSpaceEvent class with the type EVT_END_OUT_OF_SPACE. Triggering such an event is relevant only after having triggered an EVT_OUT_OF_SPACE event. The DiameterRfOutOfSpaceEvent is relevant only when AUTO_ANSWER mode is activated. The default value of the INTERIM_INTERVAL and REALTIME_REQUIRED options can be overwritten dynamically by the application for a specific session by using the setSessionParameter() method. 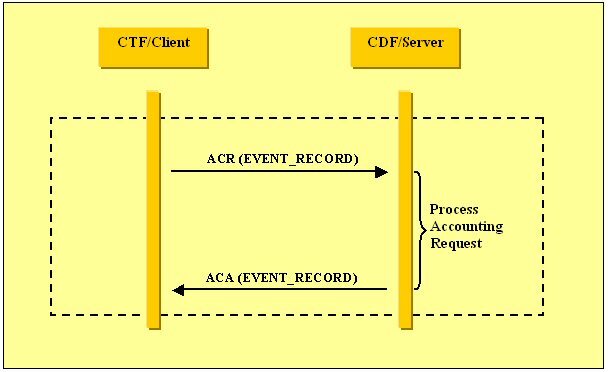 ACR(EVENT_RECORD) stands for Accounting-Request message with Accounting-Record-Type AVP set to EVENT_RECORD and request flag set to true.ACA(EVENT_RECORD) stands for Accounting-Answer message with Accounting-Record-Type AVP set to EVENT_RECORD and request flag set to false. Below are the different types of FSM which can be implemented in Rf application. This FSM responds to the [RFC 3588] requirements which define the client side state machine. A session instantiated by an application implementing this FSM expects to receive an accounting request message including an Accounting-Record-Type AVP value set to EVENT_RECORD or START_RECORD as first received message. Once an accounting request message with the Accounting-Record-Type AVP value set to START_RECORD is received, the FSM expects to receive other(s) accounting request message(s) with the Accounting-Record-Type AVP value set to INTERIM_RECORD or STOP_RECORD. The reception of an accounting request message including an Accounting-Record-Type AVP value set to STOP_RECORD corresponds to the end of the session. This FSM responds to the [RFC 3588] requirements which define the server side state machine that may be followed by applications that require keeping track of the session state at the accounting server. An application implementing this FSM waits for a request accounting message and sends a response with the same Accounting-Record-Type AVP value as received in the request message. A session instantiated by an application implementing this FSM expects to receive an accounting request message including an Accounting-Record-Type AVP value set to EVENT_RECORD or START_RECORD as first received message. Once an accounting request message with the Accounting-Record-Type AVP value set to START_RECORD is received, the FSM expects to receive other(s) accounting request message(s) with the Accounting-Record-Type AVP value set to INTERIM_RECORD or STOP_RECORD. The reception of an accounting request message including an Accounting-Record-Type AVP value set to STOP_RECORD represents the end of the session. This FSM responds to the [RFC 3588] requirements which define the default server side state machine requiring the reception of the accounting records in any order and at any time, and doesn't place any standard requirement on the processing of the records. An application implementing this FSM waits for a request accounting message and sends a response with the same Accounting-Record-Type AVP value as received in the request message. This section defines a Java API for the 3GPP [TS 32.299] Ro Interface over the Diameter protocol ([TS 32.225], [TS 32.200] and [TS 32.240] in order to specify). The Properties parameter specifies the features that will be handled by this Ro provider. This is a list of properties which may contain a number of options. See section [4.2.6] for know more about Ro Application options. The DiameterRoListener interface processes accounting messages that are received by the DiameterRoProviderImpl class implementing the DiameterRoProvider interface. A DiameterRoListener instance is registered to a provider by the following method DiameterRoProvider. setDiameterRoListener (). This interface provides four principles methods: creditControlRequestReceived(), creditControlAnswerReceived(), reAuthRequestReceived() and reAuthAnswerReceived().The first and third one must be implemented and called when the option AUTO_ANSWER is set to false. In this case, the server must be able to create an accounting answer corresponding to the received accounting request. The second and last methods process the received accounting answers. This method creates a RAA, specifying only the Result-Code AVP. The 3GPP Ro Interface dictionary is returned by getRoDictionary() and must be extended by the Diameter stack. Like any Diameter application, an Ro application can receive/send events from/to the Diameter stack. TRA_TIMEOUT_EXPIRED: The event is triggered by the stack when the RAA is not sent on time by the application. GRANT_SERVICE: The event is triggered by the stack when service is granted by server. BACKUP_SERVICE: The event is triggered by the stack when Tx2 timer expired and backup server needs to be contacted by the application. ERROR_SERVICE: The event is triggered by the stack when a service error is detected by the stack. EVT_NOBACKUP_ACCEPTED: The event can be triggered by the application to inform the stack that it doesn't have any backup server address. EVT_BACKUP_SUCCESS: The event can be triggered by the application to inform the stack that it received a successful credit control answer from the backup server. EVT_BACKUP_FAILED: The event can be triggered by the application to inform the stack that it received a failed credit control answer from the backup server. These events are relevant only when the stack has sent a BackupService event to the application. CCR(EVENT_REQUEST) stands for Credit-Control-Request message with CC-Request-Type AVP set to EVENT_REQUEST.CCA(EVENT_REQUEST) stands for Credit-Control-Answer message with CC-Request-Type AVP set to EVENT_REQUEST. Below are the different types of FSM which can be implemented in Ro application. This FSM responds to the [RFC 4006] requirements which define the session-based credit control client state machine when the first interrogation is executed after the authorization/authentication process.A session instantiated by an application implementing this FSM expects to send a credit control request message including a CC-Request-Type AVP value set to INITIAL_REQUEST as first sent message. Once an credit control answer message with the CC-Request-Type AVP value set to INITIAL_REQUEST is received, the FSM expects to send either other(s)) credit control request message(s) with the CC-Request-Type AVP value set to UPDATE_REQUEST or UPDATE_REQUEST or a Re-Authentication request message. The reception of a credit control answer message including a CC-Request-Type AVP value set to TERMINATION_REQUEST represents the end of the session. This FSM responds to the [RFC 4006] requirements which define the event-based credit control client state machine.An application implementing this FSM sends a credit control request message with the CC-Request-Type AVP set to EVENT_REQUEST and waits for the credit control answer with the CC-Request-Type AVP set to EVENT_REQUEST. The reception of a credit control answer message including a CC-Request-Type AVP value set to EVENT_REQUEST represents the end of the session. This FSM responds to the [RFC 4006] requirements which define the credit control server state machine. An application implementing this FSM waits for a credit control request message and expects to send a response with the same CC-Request-Type AVP value as received in the request message.A session instantiated by an application implementing this FSM expects to receive an accounting request message including an CC-Request-Type AVP value set to EVENT_REQUEST or INITIAL_REQUEST as first received message. Once a credit control request message with the CC-Request-Type AVP value set to INITIAL_REQUEST is received, the FSM expects to receive other(s) credit control request message(s) with the CC-Request-Type AVP value set to UPDATE_REQUESTor TERMINATION_REQUEST. The emission of a credit control answer message including a CC-Request-Type AVP value set to TERMINATION_REQUEST represents the end of the session. This section defines a Java API for the 3GPP [TS 29.328] and [TS 29.329] Sh Interface over the Diameter protocol. This section provides information about the 3GPP/Sh Diameter Java Interface. The DiameterShProvider interface represents a Sh Diameter Application as defined in 3GPP Interfaces. An instance of a class implementing this interface can be obtained by calling the DiameterStack.createDiameterShProvider(Properties)The Properties parameter specifies the features that will be handled by this Sh provider. This is a list of properties which may contain a number of options. See section [5.2.6] for know more about Sh Application options. These methods process the received Diameter messages. The 3GPP Sh Interface dictionary is returned by getShDictionary() and must be extended by the Diameter stack. 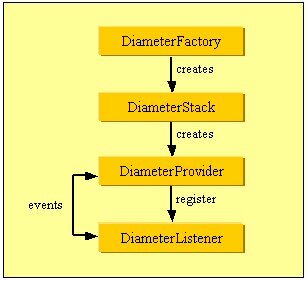 Like any Diameter application, an Sh application can receive/send events from/to the Diameter stack.To receive an event from the Diameter application, user has to implement the processEvent(DiameterEvent) callback in the DiameterShListener implementation. This section presents an example of an accounting call flow and describes in detail the steps that are performed by a typical Accounting Diameter application to represent it. The aim is to show how to use the Rf Java API to exchange accounting information between the Accounting Client and the Accounting Server. The following figure shows the transactions that are required on the Diameter offline interface in order to perform event based charging. It's an example of a call flow between an Accounting Client and an Accounting Server. Description of "Figure A-3 Accounting Call Flow Example"
The network element (acting as client) sends an Accounting-Request (ACR) with Accounting-Record-Type AVP set to EVENT_RECORD to indicate service specific information to the CDF (acting as server).The server processes the received Accounting-Request and returns an Accounting-Answer (ACA) message with Accounting-Record-Type AVP set to EVENT_RECORD to the client.The following section describes all the steps that must be performed to create a Rf client/server Diameter Application. The steps where the side (client or server) is not specified are common to both sides. Description of "Figure A-4 Oracle Diameter Stack Creation"
Get an instance of the DiameterFactory class myFactory using the following method: DiameterFactory.getInstance(). Create myStack, an instance of the DiameterStack class, using the following method: myFactory.createDiameterStack(). Once the Diameter stack is defined, the current accounting application objects may be instantiated. An Accounting Diameter application is represented by instances of the two following interfaces: DiameterRfProvider and DiameterRfListener. The former represents the Accounting Diameter application for use by the higher-level user code; the latter represents the Accounting Diameter application for use by the Diameter stack. The DiameterRfProvider interface is used by the higher-level user code to send accounting messages (Accounting Request(ACR) and accounting Answer(ACA)) and control the application behavior. All the call back methods defined in the DiameterRfListener interface are used by the Diameter stack to deliver these accounting messages and some events to the user code. Description of "Figure A-5 Rf Provider Creation"
Create my Rf Provider, an instance of DiameterRfProvider, using the following method: myStack.createDiameterRfProvider(). The instantiation is done with the application name matching the one configured in the xml dictionary, and attach it to a listener so that it receives all incoming messages. Among the parameters passed during the provider creation, properties is a set of accounting options previously defined at the section [3.2.6] and refFSM is the reference to the FSM to execute. Description of "Figure A-6 Rf Listener Creation and Registration"
DiameterRfListenerImpl is an implementation of DiameterRfListener interface and may be implemented by the application programmer. myRfListener is an instance of DiameterRfListenerImpl. Attach myRfProvider to the created listener myRfListener using the following method: setDiameterRfListener(). The Accounting Application has to create one or several instances of the DiameterListeningPoint interface to listen for incoming connections on one or several transport addresses. As soon as the listening point has been created, the Diameter stack is ready to accept incoming connection from remote peers which can be declared by using the createDiameterRoute() method. Description of "Figure A-7 Routes and Listening Points Creation"
Create a route configuration using the following method: myStack.createDiameterRoute() but it's not mandatory for server process, if the isUnknownPeerAuthorized() callback is implemented in the listener. This call back is called if the Diameter stack receives a connection request from a peer that has not been declared in the routing table. The connection is accepted only if this method returns true. Once the initialization and configuration phase is over, the Accounting Diameter application is able to send and receive Diameter accounting messages (ACR/ACA). Description of "Figure A-8 ACR Creation"
Get an instance of the DiameterRfMessageFactory class myDiameterRfMessageFactory using the following method: getDiameterRfMessageFactory() for the client side. Create an Accounting Request for the client side, an instance of the DiameterMessage class, using the following method: createAccountingRequest(). All incoming messages are delivered to the user accounting application through the DiameterRfListener interface. When accounting messages (ACR/ACA) are received by the client or server side, the corresponding call-back implemented by the programmer is called. For example, if an accounting Request (ACR) is received, the accountingRequestReceived() call-back is called. In all the other cases, the received messages are delivered through the myRfListener.processEvent() implemented by the accounting application programmer. Description of "Figure A-9 ACR Reception"
Create a client diameter session, an instance of DiameterSession, by using the method: createClientDiameterAcctSession(). Send the created Accounting-Request (ACR) myACR to the server side by using the method: sendMessage(). 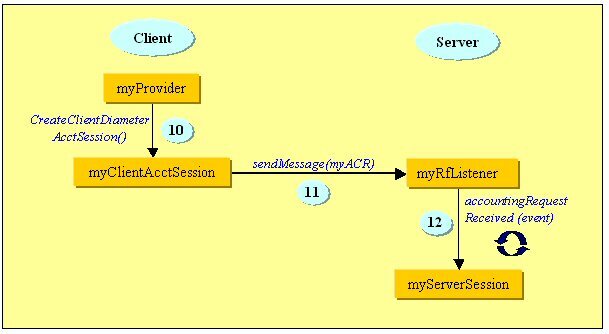 Process an incoming Accounting-Request (ACR) message contained in the received event by using the following method: accountingRequestReceived(event). Create a server session from the received request. This session, on server side, can be deleted just after sending the answer. Description of "Figure A-10 Creating the Corresponding ACA"
Get an instance of the DiameterRfMessageFactory class myDiameterRfMessageFactory by using the method: getDiameterRfMessageFactory() on the server side. Create an Accounting Answer for the server side, an instance of the DiameterMessage class, by using the method: createAccountingAnswer(). All incoming messages are delivered to the user accounting application through the DiameterRfListener interface. Description of "Figure A-11 ACA Reception"
Send the created Accounting-Answer myACA to the client side. Process the incoming Accounting-Answer (ACA) message contained in the received event by using the method: accountingAnswerReceived(event). In the last step, a global cleaning of all created routes, providers and listening points is done. Description of "Figure A-12 Cleaning Up of Routes, Providers, and Listening Points"
Delete the created provider by using myStack.deleteDiameterRfProvider(myRfProvider). Delete all the created routes by using myStack.deleteDiameterRoute(route).